Wives, submit to your husbands as to the Lord. For the husband is the head of the wife as Christ is the head of the church, his body, of which he is the Savior. Now as the church submits to Christ, so also wives should submit to their husbands in everything. Husbands, love your wives, just as Christ loved the church and gave himself up for her to make her holy, cleansing her by the washing with water through the word, and to present her to himself as a radiant church, without stain or wrinkle or any other blemish, but holy and blameless. In this same way, husbands ought to love their wives as their own bodies. He who loves his wife loves himself. After all, no one ever hated his own body, but he feeds and cares for it, just as Christ does the church-- for we are members of his body. "For this reason a man will leave his father and mother and be united to his wife, and the two will become one flesh." This is a profound mystery--but I am talking about Christ and the church. However, each one of you also must love his wife as he loves himself, and the wife must respect her husband. So very, very true. I have broached this subject before in my writing as well, and I think it is something that wives can stand to hear time and time again. We should be preaching this truth to ourselves because society is very backwards on this very issue and it's easy to give in to that. I like that scripture. I find it interesting that there is also scripture that says husband love your wives like Christ loves the church. Women need love most (and respect too, but it's not the same) and men need respect (and love too, though not the same). Respect is so important. 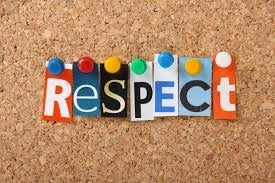 Really, all people deserve our respect, but especially the ones we love the most! Great reminder! Reading over all of these tips have me really reevaluating my marriage and the things that I can do to improve it! It's such hard work and it can be so easy to get discouraged with all the daily ups and downs and stresses of life. Sometimes, we just have to sit back and remember how simple it is to make changes!! This is so true. Could not agree more. Thanks so much for the reminder!